Sensei Burns was accepted as a student of the most senior Wado instructor in the world, Tatsuo Suzuki and joined the Wado International Karatedo Federation (WIKF). He has traveled to Japan, Spain, Portugal, Puerto Rico and across the US to train with Suzuki Sensei. In 2003 while visiting Japan, he was personally asked by Tatsuo Suzuki to organize and host the 2005 WIKF World Championships which was one of the largest and most successful championships held by the WIKF. He is currently the Chairman of the Board of Directors for the USA branch of the Wado International Karatedo Federation (WIKF USA) and in 2008 was appointed by Tatsuo Suzuki as the Pan American Regional Director for WIKF. He currently holds a fourth degree black belt earned from Tatsuo Suzuki. Each year he hosts the Suzuki Cup tournament and training in Dallas, Texas in honor of his teacher. The event draws participants from across the Pan American Region and features a Team Kumite event that often draws members of national teams including US team members. The Suzuki Cup is one of the largest traditional karate tournaments in the US. He is the Head Coach of WIKF Texas, the competition team of the Academy of Classical Karate. Sensei Burns is proud of his team’s track record and has coached several State and National Champions. He has helped members of his team qualify for the US National Karate Team and represent the United States in international competitions. He is a certified Coach, by USA Karate and has taken the US Team to international competitions in Europe. 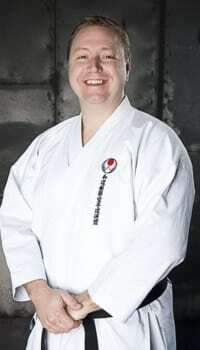 He currently coaches members of both the USA Senior Team and USA Junior Team at his dojo in Plano. Sensei Burns was a Police Officer for 12 years before becoming a Special Agent for the United States Postal Inspection Service. He has a Bachelor of Science Degree from Sam Houston State University in Criminal Justice and is currently assigned to a Fraud Team responsible for investigating various high dollar fraud related crimes that occur throughout the country. In addition to his investigative duties, he was the Defensive Tactics Coordinator for the Police Department and was responsible for training fellow Officers in the proper use of force and control tactics. He is on the faculty at Collin County Community College where he has taught Self-Defense and Karate courses to hundreds of students.